NetSuite Inc. (NYSE: N), the industry’s leading provider of cloud-based financials / ERP and omnichannel commerce software suites unveiled SuiteGL, a new product release packed with breakthrough capabilities for the general ledger component of NetSuite cloud ERP that can enable businesses to tailor general ledger processes to their unique business needs. The first and only cloud ERP solution to make general ledger-related customizations readily accessible to the business, NetSuite has combined the power of the SuiteCloud Development Platform with the world’s leading cloud business management software suite to give finance professionals new flexibility and visibility, richer reporting functionality, enhanced audit trails and new support for multinational financial management. With SuiteGL, NetSuite customers and NetSuite Solution Provider partners can now transform the general ledger from a static subsystem into a dynamic business asset that is more adaptable to specific business requirements and changing conditions that automatically carries forward with every upgrade. NetSuite’s new GL customizability addresses the needs of finance teams, from small and mid-sized companies to Fortune 500 multinational organizations, to more flexibly accommodate a growing diversity of operational and financial requirements. These can include adapting accounting practices to the complex and widely varied standards of different nations, strengthening compliance with Sarbanes-Oxley and other regulations and satisfying industry- and company-specific requirements. Traditional ERP systems provide a hard-coded set of transaction types such as vendor bills, customer invoices and inbound/outbound payments that are rigidly reflected in the general ledger, limiting the business’s ability to see and understand their GL impact. With traditional on-premise ERP systems such as Microsoft Dynamics GP or Sage, customizations related to the GL typically requires a costly third-party IT consulting team to edit the core code of the application, introducing business risk, maintenance issues and re-engineering upon an ERP upgrade because customizations won’t carry over to the next version. NetSuite’s innovations transform the GL from a “one-size-fits-all” subsystem to one tailored to a business’s specific needs. The greater visibility and control offered in NetSuite empower businesses to improve their agility, decision-making capabilities and effectiveness in adopting new business models or entering new markets. Unlike on-premise ERP, any GL-related customizations made in NetSuite carry over seamlessly during NetSuite’s twice-yearly updates, eliminating the prospect of “version lock” that organizations face with in-house applications. Unveiled by Mr. Goldberg today during a keynote address at SuiteWorld 2014, the new SuiteGL capabilities known as custom GL lines, custom transaction types and custom GL segments are scheduled to be rolled out beginning later this year. These three new capabilities, in conjunction with NetSuite’s enterprise-class business management suite and SuiteCloud platform, ensure that NetSuite is ready to support the business processes of any type of business in any geography. Custom transaction types. With this capability, users can easily design custom transaction types unique to a company or industry, with corresponding GL capabilities such as type-specific transaction numbering, roles and permissions, reporting and more. 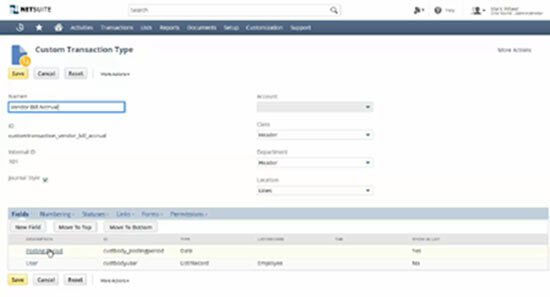 Built on NetSuite’s scalable and robust core ERP capabilities and, in conjunction with SuiteFlow and other aspects of the SuiteCloud platform, custom transaction types enable the business to define entirely new GL-impacting business processes with their own approval process and routing, discrete audit trail and permission controls and type-specific transaction numbering, reducing the time and effort required for account reconciliation and audit processes. As an example, a user could define their own business process for calculating, approving and posting accruals for vendor bills that are pending with accounts payable (applying filters such as vendor, currency and subsidiary) that would be reversed upon approval of the bill. This business process would utilize a custom transaction type named “Vendor Bill Accrual” which is accessible only to users in the finance department. This custom transaction type has a discrete approval process as part of the month end close period, has its own numbering sequence and is easily identifiable and differentiated from other transactions in the corresponding GL accounts. Custom GL segments. Finance teams gain more robust and flexible reporting with the new ability to define unlimited custom GL segments such as profit center, fund, program, product line and more, in addition to the subsidiary, class, department and location segments standard in NetSuite. As an extension to NetSuite’s built-in transaction integrity management, custom GL segments improves accuracy and saves time for the finance department by ensuring that financial impact follows double-entry accounting principles and balances across all segment combinations. These capabilities enable users to “tag” the GL impact of transactions, create sophisticated relationships between segments and improve flexibility and results from reporting and analytics. Custom GL segments is scheduled for release in NetSuite Version 2015.2 in the second half of 2015.